COMEDK UGET Exam 2019: Are you searching for info on COMEDK UGET 2019? then you are at right place. We have this article made only for COMEDK exam. This year this entrance exam will be conducted on 12th May 2019. But before exam let get into more about the exam, so go below and read about COMEDK UGET exam eligibility before applying and filling the application form. Also, we are discussing UGET 2019 syllabus for B.Tech and B.Arch courses in participating colleges. 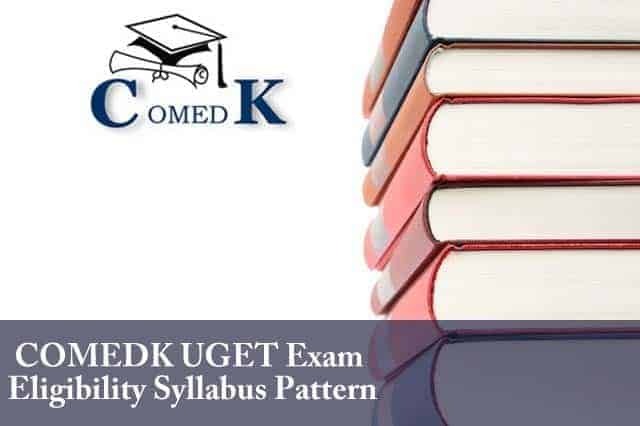 Here in this article, we are going to talk about COMEDK UGET Exam Eligibility criteria for candidates, UGET 2019 Syllabus pattern and mock test/Sample Papers for UGET preparation. You can fill the COMDEK UGET Application form 2019 online at the official portal as it is available now. COMEDK UGET is one of the biggest exam held in India as it is conducted in 697 centers in 151 cities with over 20,000 B.Tech seats alone. There are 181 colleges that are affiliated to COMDEK which constitute both government and private colleges. Higher rank students will be placed first in government and then private colleges. But admission is entirely dependent on candidate choice in option entry at the time of filling counselling form online. To get a seat in the exam hall and after that, in counselling rounds, you need to qualify certain eligibility criteria which are mentioned below. COMEDK UGET Eligibility 2019 are in different categories like age, education qualification, domicile criterion, reserve category and more. To appear in the exam, you must fulfill them as a board has strictly specified that they will not entertain any students who fail to comply with minimum eligibility requirement set by COMDEK. Below is the list of things which must have to apply for B.Tech and B.Arch courses in COMDEK-2019. Optional subjects – Chemistry, Biology or Biotechnology or any other technical vocational courses. For SC, ST and OBC candidates minimum 50% in PCM is set by the board. 10+2 or 2nd PUC or equivalent examination passed. For SC, ST and OBC candidate’s minimum is 45% marks. 10+3 diploma passed student are eligible if done from by central or state government. No entrance test to be held for B.Arch student, as NATA score card 2019 are taken as admission requirement with cut off of 80 marks from 200. For B.Arch, you have to fill the separate application form available online at UGET portal. Each MCQ question is of one marks, and there are no negative marks for an incorrect answer, so it is advised that you not leave any question unanswered. There will be three section in written test Physics, Chemistry, and Mathematics. Physics & Chemistry section exam will be held together with the time of 2 hours and Maths section exam will be held separately for 1 hr time limit. Physics, Chemistry, and Mathematics Syllabus for the entrance exam for admissions to B.Tech/B.E. If you have any queries, then comment below, and one of our team assistants will soon reply to your query. Till then you can subscribe or like our FB page.